Artist Simon Black has presented the first of four specially commissioned painting to the trust. 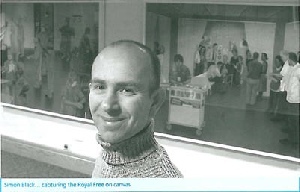 Theatre pre and The ward round, which are on display in the atrium, capture on canvas different aspects of life at the Royal Free as seen through the artist's eyes. Theatre prep, which shows theatre staff getting ready for surgery, is a very detailed, dynamic and busy scene with plenty of movement. Simon likens it to the other type of theatre. "Everyone is getting dressed up, putting on their masks and gowns, and washing their hands. The scene is almost choreographed. This became a very stong image in my mind, which I found very inspiring. Everyone has their different roles in the 'drama', but they are all dependent on each other." Ward round is set in the paediatric department. It has a family group at its centre, but focuses on the different staff members all around, again emphasising their teamwork. Simon is now working on the remaining two commissions. "This is a fantastic opportunity for me. It's a challenge to encapsulate the work of such a massive trust in a few paintings." Martin Else, the trust's chief executive, said: "We are delighted with these paintings, which show how so many different groups of staff can work together and interact. The four paintings together will show the breadth of the trust's services and emphasise that every staff member is important and has a role to play. "The hospital has a long tradition of using art to enhance the environment for patients and staff andf these works also serve as an important record of hospital life at the beginning of the new millennium."